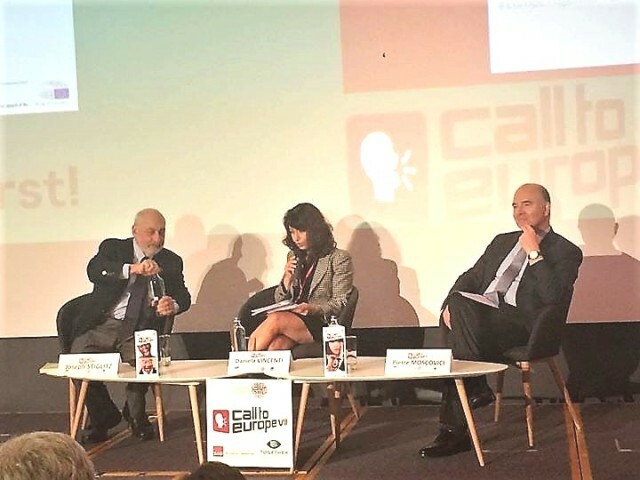 On Thursday 29th June, the 7th edition of the Foundation for European Progressive Studies (FEPS) flagship conference “Call to Europe” took place at the Management Centre Europe in Brussels. FEPS conference has been a unique opportunity to gather and link all the best progressive ideas. A debate aimed to fight inequality and build a more meritocratic and human society, closer to citizen’s priorities. The Conference started with an introduction by the former Italian President Massimo D’Alema, who highlighted the event main keynotes and reported the challenges the progressive community must deal with, from the Trump’s election to the immigrant’s issue, from the Euro-scepticism to the right-wing populism and so on and so forth. The introduction was followed by the main conference appointment, namely “Debate: Democracy First Re Writing the Rules Of The Eu Economy” attended by Joseph Stiglitz (Nobel Memorial Prize in Economic Sciences – 2001) and Pierre Moscovici (European Commissioner for Economic and Financial Affairs, Taxation and Customs). The Conference continued with two different “Big Debates” in which took part four different groups, such as Politicians, Academics, Journalists and Civil Society representatives who discussed on different topics related to the challenges for the Progressives. During “Call to Europe” came in succession speeches by eminent personalities such as Maria Joao Rodrigues, Sergei Stanishev, Bruno Liebhaberg and Zita Gurmai. In order to read our report on the conference, please click on this link: Call to Europe VII.compressed . Have a good reading!